Not many of us are lucky enough to be able to have an entire room in our homes for a home office. And when we do, the space often has to work hard to do double duty, usually as a guest bedroom or a working space for 2. 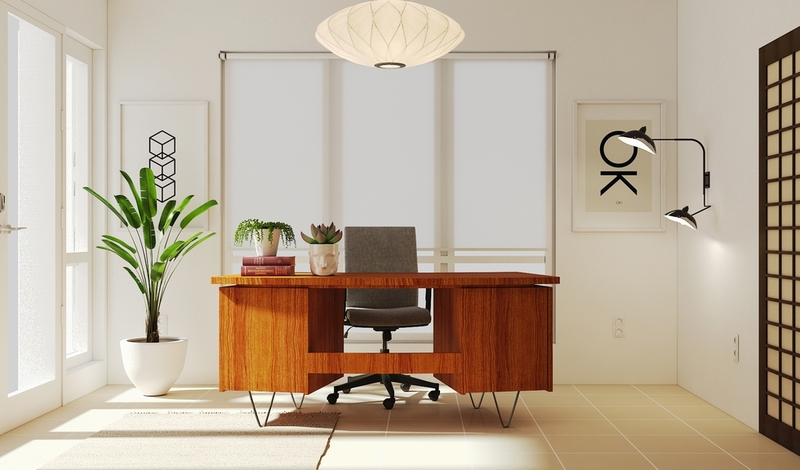 We love these 8 home office projects because they not only check off multiple functional boxes but they look like spaces you might not mind spending a little extra time in. 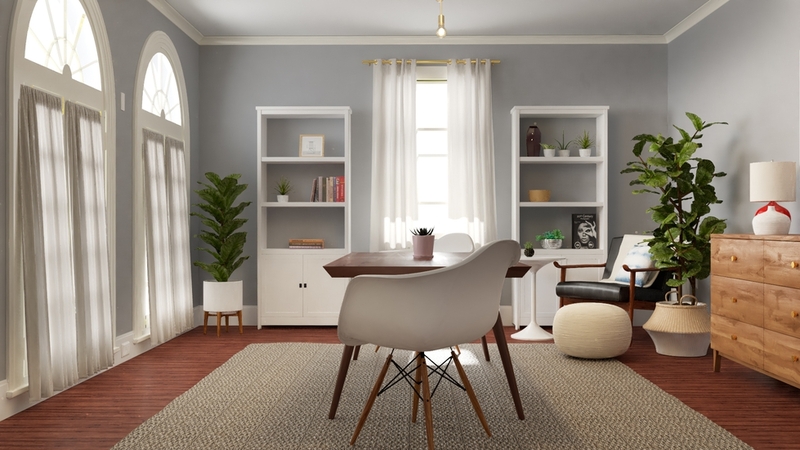 Whether you're using your home office to work from every day, or whether it's a quiet and organized spot to pay bills and check email, or whether it's a place for potential client meetings, here are 8 spaces where you can WFH in style. 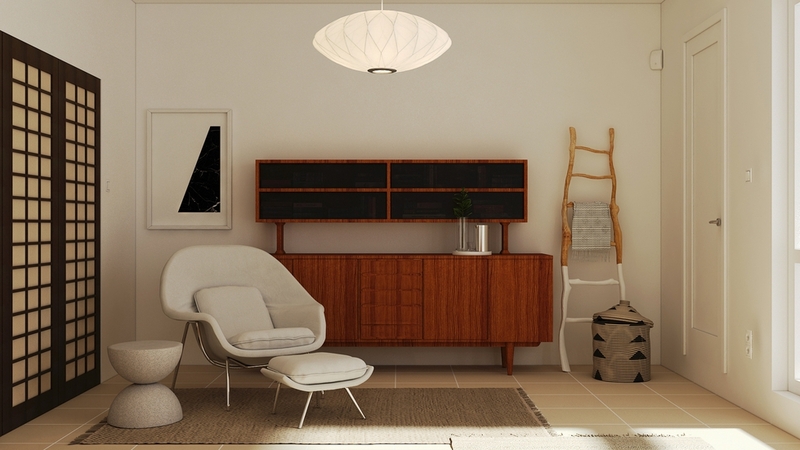 This small alcove has maximum layout efficency, with working space for 2 and lots of storage. 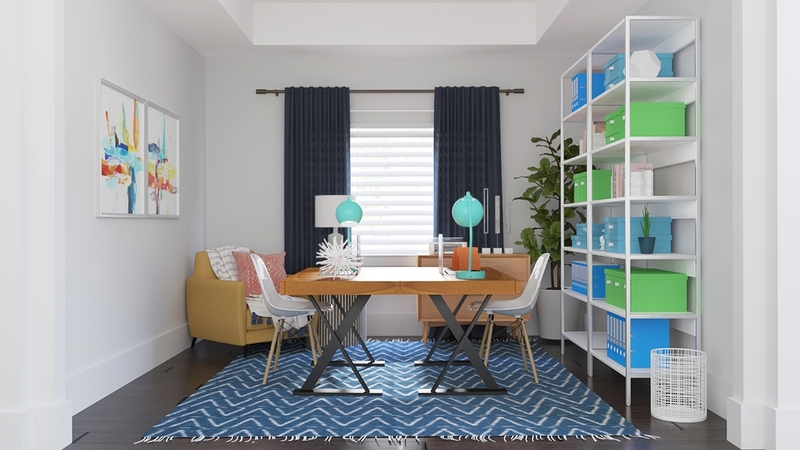 The bold and vibrant color scheme brightens up the space for these clients who work from home. Open shelving provide critical storage without making the space feel smaller. 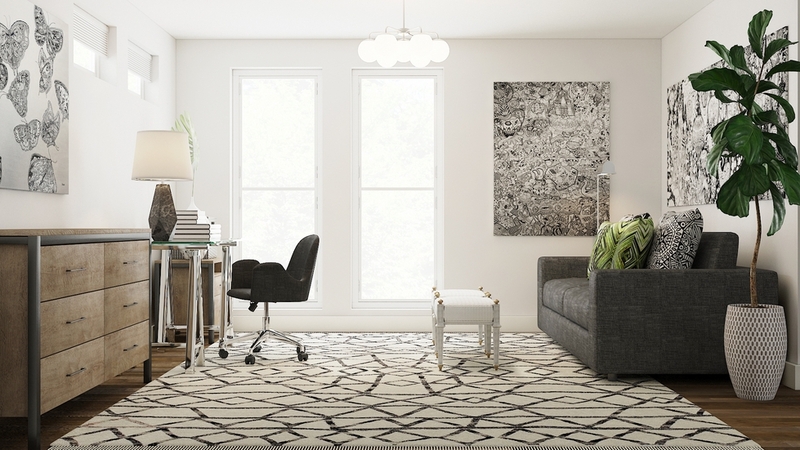 This client is an Los Angeles-based artist and wanted a home office that did triple duty as a guest bedroom as well as a place to showcase her art. This set-up allows plenty of wall space for a rotating gallery of her work and a sofa for for potential client meetings. For guests staying over, the sofa folds out into a queen-sized bed. The neutral color palette provides just enough visual interest while keeping the focus on the large-scale intricate art pieces. This shared space is luxuriously spacious with elegant molding details and high ceilings. A sophisticated soft teal and an Art Deco-inspired chandelier are unexpected choices that help make this home office feel less like a place just for work, but also a space to relax and unwind in. Any client who requests a secret bar in their home office is our favorite kind of client. 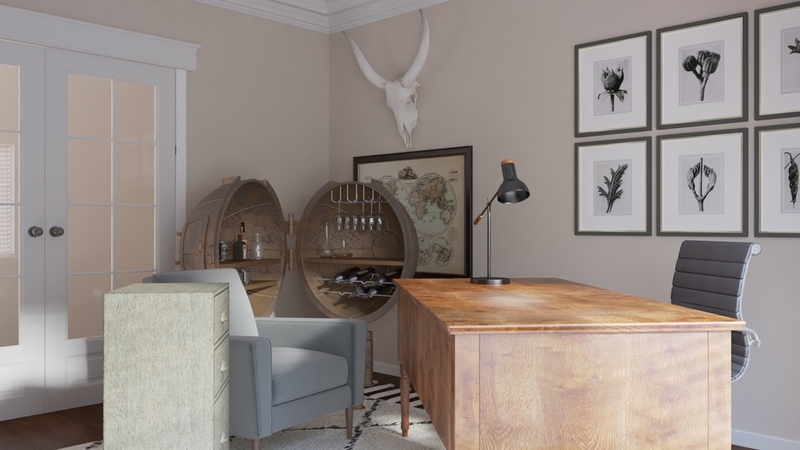 While the design is a great mix of traditional-meets-industrial with Southwestern elements, the highlight of this home office space is what looks like a vintage metal sculpture at first glance but opens to reveal everything to make the perfect martini. Make ours a double, please. 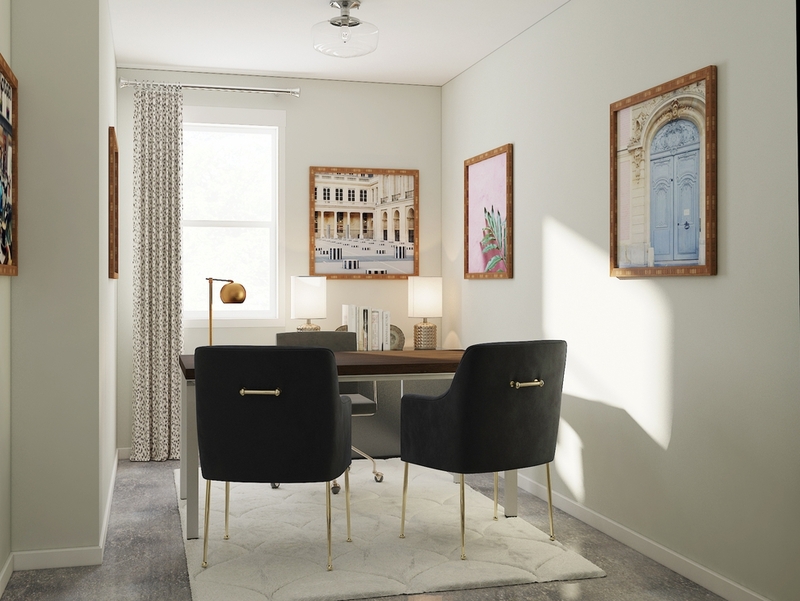 This home office project for a photographer client had an advantage going in - her designer didn't have to look further for artwork than her client's own portfolio. 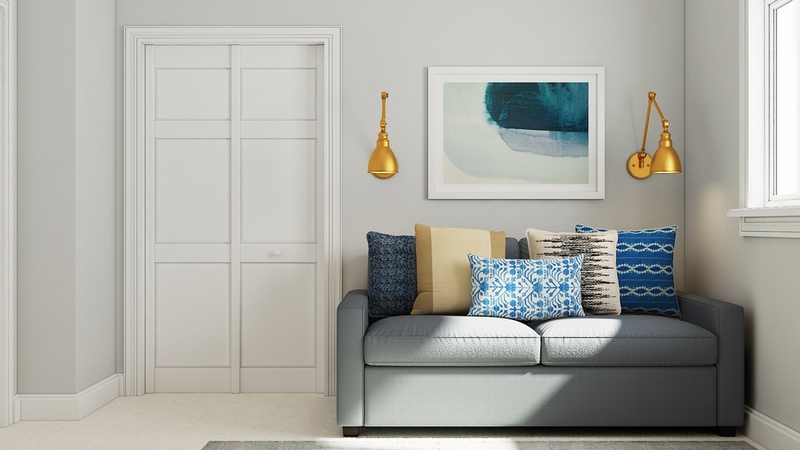 A soft cream color on the walls is a great backdrop for the vibrant photography. Metallic accents throughout the room are just enough to give any potential photography clients the impression that they're in the hands of someone who's notices the details. 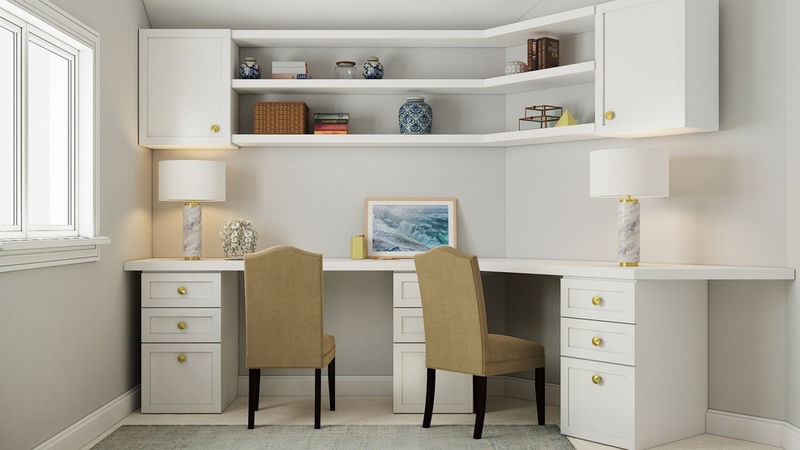 These clients didn't want a space that looked like a home office. 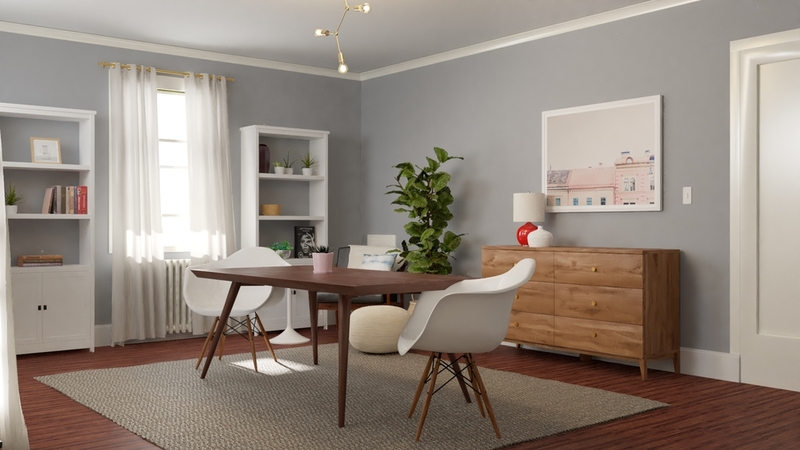 With a large expansive table that easily fits multiple people but also just as easily allows someone to spread out to work on a crafts project, this space is all about flexibility. Ample storage allows all signs of work to be put away when not in use. A comfy armchair in the corner means our client is two steps away from turning this home office into a reading room. 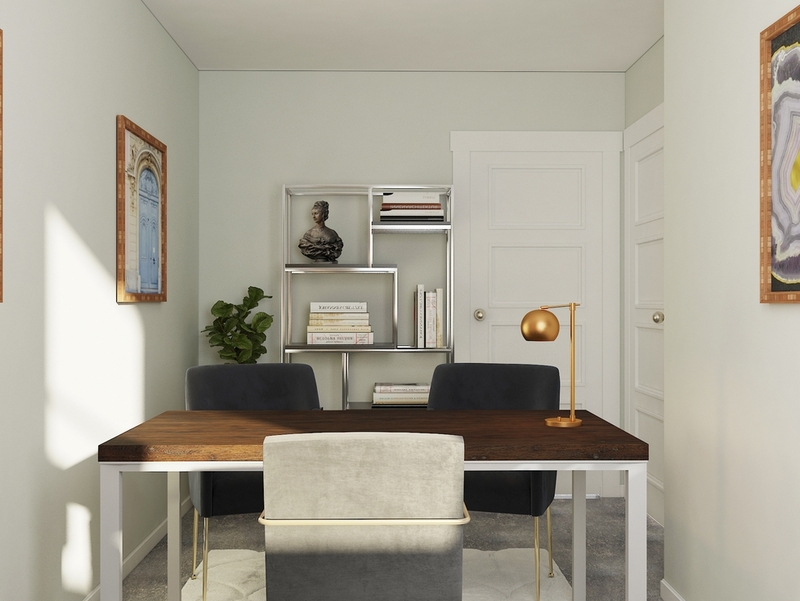 This home office space is a textbook study in minimal design, and each piece was carefully chosen to make an impact. Drawing inspiration from Japanese design, with clean lines, organic materials and textures, and a muted color palette, this home office is the perfect place to focus. 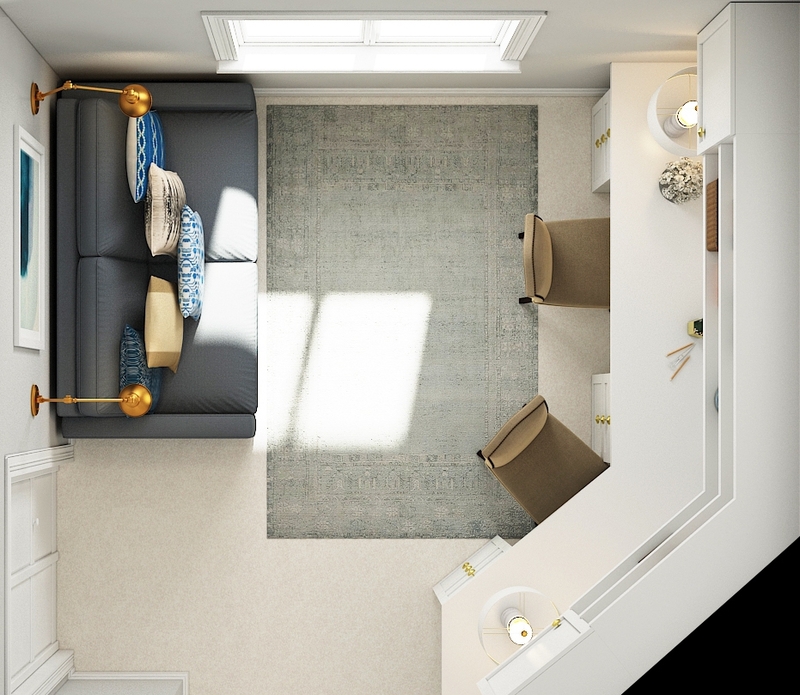 This small space fits an office for 2 and a sofa that folds out into a full bed for overnight guests. Our client was doubtful that her designer would be able to fit it all in, but the proof is in the finished room below. Check, check and check.